It’s a book! It’s a book! This week is a special BOOK RELEASE EPISODE where I finally get to say DIFFERENTLY WIRED IS HERE! I asked my dear friend, and TiLT Parenting Podcast editor, Donna Bardsley to interview me for this episode. Donna and I met in Amsterdam, where Donna created and hosted the Amsterdam Mamas Podcast (listen to this interview about homeschooling in the Netherlands here). 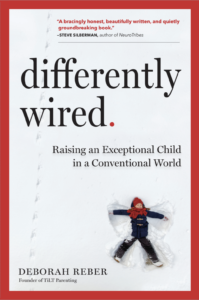 She’s a fantastic interviewer, asks great questions, and is super insightful…I thought she’d be the perfect person to have a deep conversation with about my new book Differently Wired: Raising an Exceptional Child in a Conventional World. We cover uncharted territory in this conversation, including how Asher really feels about all of this, what was the reception when I first pitched the book as a memoir, my thoughts surrounding the anticipated resistance that will stem from trying to shake up the current paradigm, and much more. I hope you enjoy the conversation! And to learn more about my book, Differently Wired, click here. About Donna: Donna Bardsley is a practicing insomniac, would-be writer, has-been podcaster, and a never-will-be foodie. As the mother of a few quirky and sensitive kids, she loves editing the TiLT Parenting Podcast. She currently lives in the Pacific Northwest with her husband, three children, and one slightly neurotic dog.